Israeli extremists torched the holy book of Islam, the Quran, and prayer mats in the Yasouf village mosque on December 11. Turkey condemned the attack by Israeli settlers on a Muslim mosque in northern West Bank last week. Turkish Ministry of Foreign Affairs expressed in a statement its "deep concern" over the attack, saying it wanted perpetrators to be brought to justice soon. 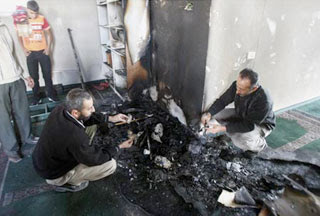 Israel should prevent such attacks from reoccurring as they might further add tensions, the ministry said. Israeli newspaperHaaretz reported that one of the two most senior religious leaders of Israel’s Jewish community paid a visit on Monday to the West Bank village of Yasuf, where a mosque was set on fire and covered with Hebrew graffiti last week. Israeli and Palestinian officials have blamed the attack on Israeli settlers.